When traveling through the backcountry, always stay on designated roads and trails. Where they are narrow, ride, hike or drive single-file in the middle of the trail. This helps to preserve the natural environment. 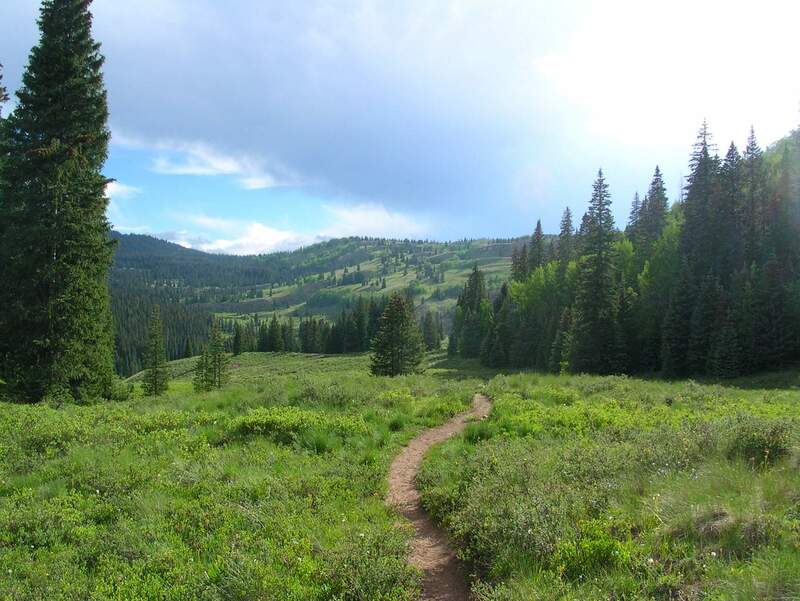 An estimated 2 million visitors will drive, hike, camp, backpack, horseback ride, fish and more on the San Juan National Forest and area Bureau of Land Management lands this summer. In the fall, an estimated 30,000 hunters will descend upon the area. With this kind of visitation to our public lands, it is becoming more important to have and to practice outdoor ethics. It is important for all of us to take a role in protecting our public lands against overuse and abuse. One small bit of food discarded on a trail or from a car, or a poorly located campsite or campfire may seem to have little significance, but thousands of such instances seriously degrade the outdoor experience for all. Leaving no trace is everyones responsibility. We must consider the combined effects of millions of outdoor visitors. What are outdoor ethics? The dictionary defines an ethic as a set if moral principles or values, or a principle of right or good conduct. I simply boil down ethics to what you do when no one else is looking. Humans generally know right from wrong and respect from disrespect. Carrying this innate knowledge with us onto our public lands will greatly reduce the abuse. Leave No Trace is more of an attitude than a set of rules. The LNT principles are designed as guidelines for us to use in the outdoors or our communities. Remembering we are visitors to the land and should act accordingly will help in the quest of protecting the environment. The LNT program is designed to combine knowledge and judgment with ethical responsibility. The seven Leave No Trace principles are guidelines that can help us enjoy our outdoor experience while making good choices that will protect our natural areas. Lets explore the LNT principle Travel and Camp on Durable Surfaces as we head into mud season. Many of our public lands roads and areas are closed during winter months to protect wildlife habitat and also to prevent roads from rutting that causes erosion. Heres where the ethics part of LNT comes in. We all get excited when the weather starts getting warmer and the itch to get outside becomes stronger. While trails and roads are thawing out, wet and muddy, it probably is not the best time to drive, hike or horseback ride on them. Respecting closures at this time is part of the ethical responsibility of protecting our lands. When we get on the trails too early in the season, the tendency is to try to skirt around wet, muddy patches, which invariably will widen existing routes. Unnecessary widening of a trail is ugly and expensive to repair. Check with land managers to see what the conditions are in the areas you want to travel. Always stay on designated roads and trails. In the desert, do not disturb cryptobiotic soils. Remember that durable surfaces include established trails and campsites, rock, gravel, dry grasses or snow and roads. Meadows and marshy areas deserve special protection. Its best not to go through them at all. Ruts made in meadows leave a lasting impression on everyone who sees them. Ride, hike or drive single-file in the middle of the trail, even when wet or muddy. For additional information about LNT, visit any of the San Juan Mountains Association bookstores or log on to www.LNT.org. Kathe Hayes is volunteer program director for SJMA and is a Leave No Trace master educator. She can be reached at 385-1310 or log on to www.sjma.org.